Our business is all about making and keeping long-term commitments to people. Trust is the essential ingredient of our long-term success. In this context having a clear set of values and ethics is critical because it provides us - individually and collectively - with a “moral compass” to help us get to the right answer when we are confronted with the technical complexities, competing priorities and sometimes conflicting demands that are part of our day-to-day realities in doing our jobs. AXA has a long history of commitment to strong professional ethics. We have developed this new Compliance & Ethics Code to establish a shared understanding of what is expected from each of us and the Group’s businesses. Those commitments must guide each one of us in the performance of our daily work. There is no conflict between strong business performance and high standards of ethics, compliance and governance, in fact, they support each other. 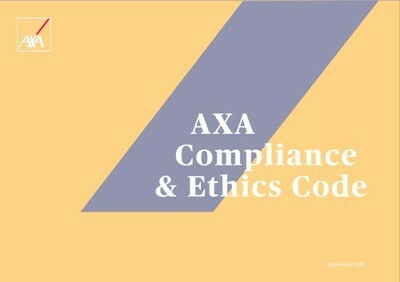 This is why I expect everyone at AXA to personally commit to follow the requirements of our new Compliance & Ethics Code. If you have questions or concerns regarding any aspect of this Code, you should raise them with your manager or your local Compliance or Human Resources teams.